The Gold Stars have arrived! Huge excitement for me this week (Mar 26, 2015) — the Gold Stars (Crocidium multicaule) have arrived! This tiny member of the Aster family shows its golden head for a short time in Spring — usually about two weeks later than this! According to Eflora, BC’s electronic atlas of provincial flora, this little gem should be available in several places in my area — on Mt. Finlayson, and up on Mt. Baldy at Shawnigan Lake. I’d be so pleased if anyone can confirm them for me, but, I have never sighted them in these locations myself. The only place I know them to exist on southern Vancouver Island is at the NW corner of Jocelyn Hill in Gowlland Tod Provincial Park. And, that is where I take myself every Spring. This year Jan, Alan, Mike, and I thought an early investigation might be in order — and we were well rewarded. The Gold Stars are out in abundance, with more on the way. Vancouver Island is toward the northern end of this plant’s range, but it is still a mystery to me why, in the Victoria area, Gold Stars only seem to grow on Jocelyn Hill. Up on the east coast of Vancouver Island they can be found putting on a dazzling display as they carpet sandy flats above the Strait of Georgia. Dave Ingram’s Island Nature blog has directions as to where they can be found up-Island. 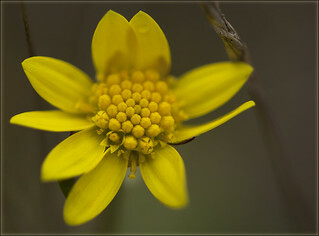 The Gold Star is a Yellow-Listed plant in BC — this means it is apparently secure and not at risk of extinction. However, habitat loss is a danger for this little beauty, so when rounding the NW corner on Jocelyn Hill, do take care where you step. Crocidium Corner on Jocelyn Hill, Gowlland Tod Provincial Park. 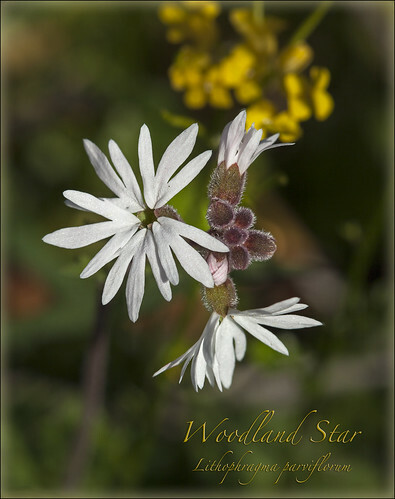 This lovely bloom, with its cream coloured petals, graceful stem, and fawn-spotted leaves is a favourite on Southern Vancouver Island and the Lower Mainland. Many folks call it “Easter Lily”, because it is usually out around Easter time. This year, like many other plants, it is out early. Vancouver Island, th e Lower Mainland, Sunshine Coast, Okanagan, and south central BC all the way to Williams Lake get to see this little beauty nodding in the breeze. This member of the Saxifrage family comes on early in the Spring. A very delicate shade of feathery pink, this flower likes dry bluffs, meadows, open forests, and grasslands. On Vancouver Island we usually see it along coastal cliffs. 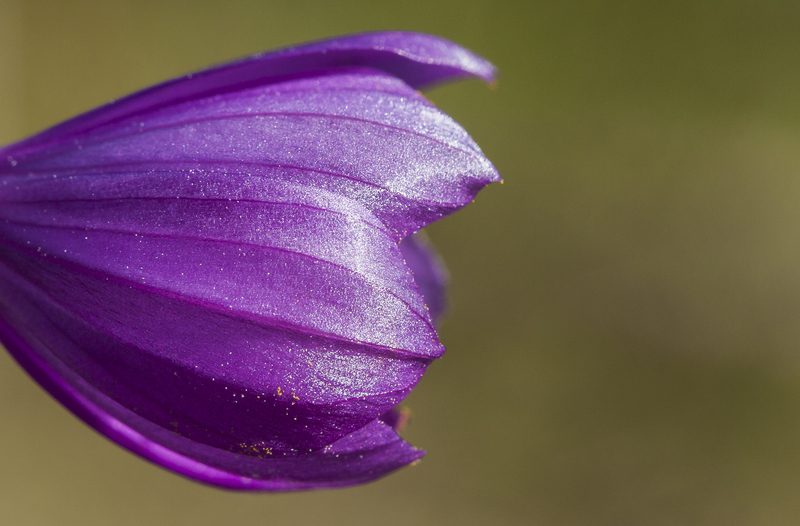 A few folks have asked about some simple tips and tricks for taking wildflower photos. I’ve got a few ideas to share that are not highly technical (and some are a lot of fun to experiment with). The 3-P’s: Patience, Practice, Perseverance. Yup, the same as with anything one wants to get good at! Wind will be your nemesis, creaky bones and joints will complain as you bend down yet again for that perfect shot, and technology will change – usually rapidly. Keep calm and carry on shooting, reflecting on your work, tweaking, learning, and fine-tuning your process. Get a remote release. This is something that lets you release (press/trigger) the shutter without actually touching the camera. It can be a cable that attaches to the camera, or an electronic remote control. With many new point and shoot cameras the cable release might not be an option. The reason you want something like this is because with closeup photography any little movement, even as slight as pushing down the shutter, can cause camera shake. Camera shake equals blurry photos. So, with your camera mounted on the tripod, I suggest some type of remote release to guard against motion blur caused by moving the camera.Remote release systems, even cables, can be pricey, so there is another method – use the timer on your camera. Many cameras have a 2 second timer, but even a regular timer (10 seconds) will work — after all, it isn’t like your subject is going anywhere! Use a light reflector. This inexpensive and light-weight item is a real help in getting ambient light into tight places, or in lighting up the underside of a plant, or even helping to balance light in a high contrast light/dark situation.I use a 22 inch disk with several different reflective “skins” I can zip into place. The reflector lets me “bounce” light into the subject. Where I bounce depends on the subject and the angle of light coming into the reflector. Of course, you can bounce a flash off a reflector, but keeping things simple, I usually stick with ambient light. Photography Life has a nice primer on using reflectors: How to use a reflector. Although they are inexpensive, you might want to try something found around the house — a bright white towel, or shirt can work, so can tinfoil, or some of that fancy reflective wrapping paper, or even a purpose for that old disco sequin dress! Be creative — however, you’ll probably need someone to help you hold these items in place. I can usually hold a purpose-built reflector myself, but sometimes I need to prop up in some way (or use one of my hiking companions). Get a kneeler. You’ll be up and down a lot — get something to kneel on. Maybe a garden kneeling pad, or one of those thin blue camping foam pads. Your knees and back (and washing machine) will thank you. Look for different angles / composition. Take your time with your subject. Move around the plant (although do it delicately – some plants are extremely sensitive to being touched), try a lower angle, try a higher angle. Try both portrait (higher than wider) and landscape (wider than higher) views. Snap and go is fine for capturing a sense of the plant and its environment, but to really infuse your work with a sense of place you’ve got to spend a bit of time with your subject and the environment it lives in (see the first point!). Use a card for background. Sometimes you see a flower you would like to highlight in a shot. 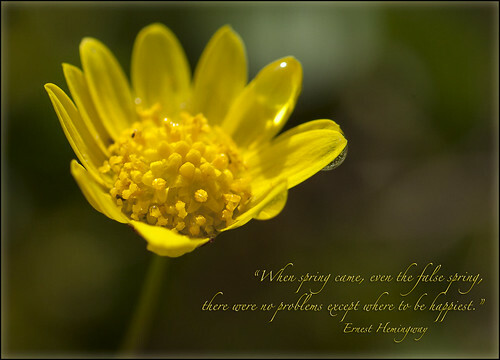 You want the entire bloom, but not the busy background of stems, grasses, twigs, etc. If you travel with a few pieces of card — they don’t have to be big — index card size or a bit bigger — you can place this behind the plant. White gives an “arty” look, while other colours can blend with the background, or serve as a good contrast to the subject. A card can also help your camera achieve focus. Sometimes the focus point in the camera can’t “grab on” to the bloom you want to capture. This is because the background is full of detail and the focus sensor doesn’t know “where to look”. If you hold a card up behind the flower, the sensor will have less clutter to sort through and will focus on the bloom. At this point you can remove the card and shoot, or keep the card in place. No card to hand – no worries — you can use your hand for the same “de-cluttering” purpose. Gently place your hand behind the subject and focus. However, you’ll almost certainly want to remove your hand before you shoot. Learn about your camera. How do you get your camera into “macro”? You’ll want macro for close up shots. How do you set a focus point? Can you “underexpose” or “overexpose” (let in less light / more light) to your image? Can you take a bit more control of the photographic process — set the aperture size (size of the hole letting light into the camera), select the shutter speed (how fast the shutter opens and closes), or choose the ISO (how sensitive the camera “film” sensor is to light)? All of these things are a bit more technical than the preceding points, but as your interest in photography deepens, you’ll probably want to know more about all or some of these things. Your camera manual can help, but so can a course at your local rec centre, college, or university. Of course, you can always “ask the Google”! For example: “A Beginner’s Guide to Photography” . Of course, the main tip is get out and have fun with your camera — who really cares whether you are shooting with the latest and greatest DSLR (digital single lens reflex), a point-and-shoot, or the camera in your phone. It’s all about being out of doors! The Wildflowers of Spring are Here! Spring is here! For the last few weeks native wildflowers have been popping up out in the hills and valleys all over my Southern Vancouver Island home. Some of these flowers are only found here on Vancouver Island, but many of them will start to make themselves known in all sorts of BC areas over the coming weeks. 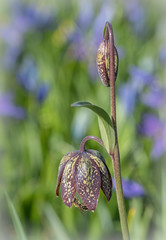 These lovely flowers are one of the earliest to show themselves on Southern Vancouver Island and the Gulf Islands. This year I found a group of them growing in a secluded spot in Beacon Hill Park on Jan 26th! That is early! The biggest and best Satinflower shows are reserved for the hills — in Victoria we can count on Mt. Wells, Mt. McDonald, and Little Mt. Doug for an exciting show. These plants carpet the hillsides and look for all the world like tiny satin ribbons bobbing in the wind. Satinflowers bloom between Feb and into April and can be seen on Southern Vancouver Island in the Sooke Hills. They love Garry Oak meadow environments. One of the best spots to see them is Mt. Wells, a park in the Victoria area. A very rare variety of Satinflower can be also be found in the sagebrush area around Kamloops, but they bloom a bit later in the season. For more information on the Satinflower check out E-Flora BC – an interactive online atlas of BC’s amazing plant life. 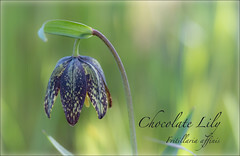 More Satinflower images can be found on my Flickr page. This lovely little member of the carrot family starts to bloom in February — usually about the same time as Satinflowers, if not a bit earlier. Its lacy leaves do indeed look a bit carrot-like, but a moment spent looking up-close at the golden, flat-topped flowers will reveal a world of complexity. This particular flower blooms on Southern Vancouver Island and the Lower Mainland, but many different species of Lomatium bloom throughout the spring and summer in BC. This image was taken on March 4 in Mill Hill Regional Park, Victoria BC. Well worth a wander throughout the entire Spring season. These Saxifrages are another group of “early risers” with both Rusty-haired and Western showing themselves in February and March on Vancouver Island and the Lower Mainland. Western has a much bigger range than Rusty and can be found pretty much throughout BC (with the exception of the far north east) – again, blooming later into the Spring and early Summer. This is another wildflower that begs a closer inspection — the detail, when you take the time to look, is amazing — petals, tiny grains of pollen, slender filaments holding things together — and all with a purpose. Saxifrage means “Rock Breaker”. This seems such a tough moniker for such delicate little plants, but if you see a flower hanging off a rocky height, or growing in a place with little soil, you are probably looking at one of these beauties. They thrive in surprising places. These images were taken on Southern Vancouver Island in the Sooke Hills Sea to Sea Green Blue Belt. More photos can be found on my flickr page. Check out E-Flora for more info on the Rusty-haired and Western Saxifrages.